Directed by Jean-Marc Vallee and written by Julian Fellowes, The Young Victoria is the story about the early life and reign of Queen Victoria in the 19th Century as she copes with her new role as Queen of Great Britain and her marriage to Prince Albert of Saxe-Coburg and Gotha. The film is a dramatized take on Queen Victoria’s early life as well as what she had to do in trying to maintain her duty as queen but also finding some self-being as a person as the role of Victoria is played by Emily Blunt. Also starring Rupert Friend, Paul Bettany, Mark Strong, Thomas Krestchmann, Julian Glover, Jesper Christensen, Jim Broadbent, and Miranda Richardson. 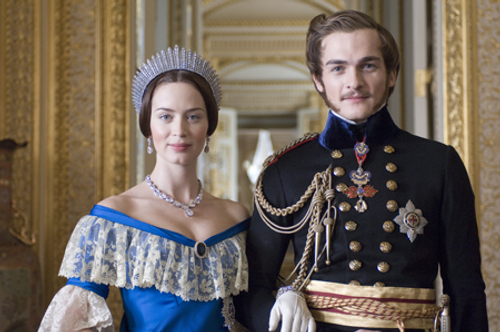 The Young Victoria is an enchanting and engaging film from Jean-Marc Vallee. The film is about the early life of Princess Victoria of Kent, who would later become Queen of Great Britain on June 20, 1837 at the age of 18, as she deals with the role she is to play where many around try to put their own interests towards her with some wanting her to fail. It’s a film that explores a woman being aware of the role she is to play as she also tries to assert her own ideas while there are many that are plotting against her with some wanting her to give up her claim to the throne. At the heart of the story is her relationship to her first-cousin Prince Albert of Saxe-Coburg and Gotha (Rupert Friend) who is sent by his uncle as a way to seduce her for political reasons but he falls for her and would end up being her greatest ally. Julian Fellowes’ screenplay does take some dramatic liberties such as an assassination attempt on Queen Victoria in 1840 as well as some of the details of her coronation and the age of Lord Melbourne (Paul Bettany) who was 40 years older than the queen. Yet, it does remain faithful to the events that was happening while creating a story that is engaging about Queen Victoria’s understanding of her role but also being aware of what is going on around her. Early in the film, she is being forced by her mother in the Duchess of Kent (Miranda Richardson) and Sir John Conroy (Mark Strong) to sign away her powers while she is ill as she would refuse to. Especially as she has a strong devotion towards her uncle in King William IV (Jim Broadbent) who isn’t fond of her mother but wants to ensure that Victoria would have her place to rule Britain despite the opposition of so many. The character of Prince Albert is definitely a unique one as he is someone that knows the pressure of what Victoria is to endure where he would have ideas that would help her and Britain. Yet, she would take the advice of Lord Melbourne as her private secretary where things don’t go as she wants them to as she ponders every decision she makes as well as the people she wants around her. Jean-Marc Vallee’s direction is very straightforward for not just capturing that period in time during King William IV’s final year but also into the glimpse of Queen Victoria’s life before she becomes queen. Though the first sequence that is presented is her coronation which would be shown again, it play into the many doubts that is looming once she becomes queen as Vallee’s direction would feature some wide and medium shots of the coronation in different perspectives. Much of the film is shot on various locations around Britain with some of it on actual palaces as well as some re-creation of the exteriors of Buckingham Palace as Vallee doesn’t go for anything stylistic but rather something simple and to the point. Even in the close-ups as it play into the anguish that Victoria endures where she would often vent her feelings through corresponding letters with Albert as it would strengthen their relationship. Vallee would also create moments that play into their growing relationship once they’re together with Albert knowing his place but also slowly do things to make sure that Victoria would be confident in her own decisions as queen. Overall, Vallee creates a riveting yet intoxicating film about the early life and reign of Queen Victoria. Cinematographer Hagen Bogdanski does excellent work with the film’s cinematography from the natural look of the daytime interior/exterior scenes to the usage of lights for some of the scenes set at night. Editors Jill Bilcock and Mat Garner do brilliant work with the editing with its usage of jump-cuts and some stylized cuts to play into the rhythm of the film. Production designer Patrice Vermette, with set decorator Maggie Gray and supervising art director Paul Inglis, does amazing work with the look of the interiors of the palaces and dining halls as well as the design of the carriages in those times. Costume designer Sandy Powell does fantastic work with the costumes from the look of the gowns as well as the clothes that the men wore in those times. Hair/makeup designer Jenny Shircore does terrific work with the design of the hairstyles and extensions they wore during the day as well as the look of the men. Sound designer Martin Pinsonnault does superb work with the sound as it play into the sparse elements of what goes on in the palace as well as the raucous sounds for some of the parties. The film’s music by Ilan Eshkeri is sublime for its low-key orchestral score that play into the drama while music supervisor Maureen Crowe creates a music soundtrack that largely consists of the music of the times including some classical pieces that Victoria and Albert have a fondness for. The casting by Susie Figgis is incredible as it feature some notable small roles and appearances from Josef Altin as the man that tried to assassinate Queen Victoria, Genevieve O’Reilly as Lady Flora Hastings, Julian Glover as the Duke of Wellington, Michiel Huisman as Prince Albert’s brother Ernest, Michael Maloney as Sir Robert Peel who briefly replaces Lord Melbourne as prime minister, Rachel Stirling as the Duchess of Sutherland who is the queen’s lady-in-waiting during her early reign, and Jeanette Hain as the queen’s caretaker in Baroness Louise Lezhen. Other noteworthy small roles include Jesper Christensen as Baron Stockmar as an advisor to Prince Albert in how to woo Victoria while Thomas Krestchmann is superb as King Leopold I of Belgium who is hoping that Prince Albert succeeds in the hopes of a political alliance with Britain and Belgium. Harriet Walter is wonderful as Queen Adelaide as Victoria’s aunt who is one of the few people that Victoria can trust and turn to as she also feels that Albert has a very important role in helping Victoria. Jim Broadbent is fantastic as King William I as Victoria’s uncle who is aware of what is going on as he doesn’t like Victoria’s mother very much while worrying about Victoria once she becomes queen. Mark Strong is excellent as Sir John Conroy as a comptroller to Victoria’s mother who wants to maintain control and influence into Victoria as a man that wants power even though Victoria hates him. Paul Bettany is brilliant as Lord Melbourne as the prime minister who becomes the queen’s advisor as someone with good intentions only to create some trouble in the queen’s early years as he would later find himself dealing with Albert for the queen’s attention in power. Miranda Richardson is amazing as the Duchess of Kent as the queen’s mother who would try to get her daughter to listen to Sir Conroy only to become estranged from her daughter until Albert would be the one to end the estrangement. Rupert Friend is marvelous as Prince Albert of Saxe-Coburg and Gotha as the man who would be Queen Victoria’s husband and greatest ally where Friend is quite restrained in his performance as someone who is just loyal and devoted to a woman he feels has a lot to offer to the world. Finally, there’s Emily Blunt in a radiant performance as the young Queen Victoria as a woman trying to deal with the role that is set upon her as well as wanting not to fail and do right for her country as it’s one of Blunt’s finest performances in displaying the anguish and determination of one of the greatest figures in history. The Young Victoria is a remarkable film from Jean-Marc Vallee that features an incredible leading performance from Emily Blunt. Along with a great supporting cast, beautiful locations, rapturous images, and some fine technical work. It’s a film that chronicles the life of a woman in her early years as she would later become a definitive figure for Great Britain. In the end, The Young Victoria is a phenomenal film from Jean-Marc Vallee. If there's one genre I shy away from more than others, it's pre 20th century British period dramas. In other words, I haven't watched this one, yet. They're just generally not my thing. That said, I have heard good things about it so I might just give it a try. Maybe. Historical movies are always ones that pique my interest. I find them so fascinating and this appears to be no exception. @Wendell-Despite a few of the dramatic liberties in the film, it is still an intriguing and fascinating film if you're into history like I am as it's cast is really what sells the film. @vinnieh-When they're done right or mostly right, they can always work as this film is a damn good example.